For our anniversary last weekend, Julia and I decided to have a simple, romantic, Italian dinner in DC. Julia chose Tuscana West, near 13th and I Streets NW (across from Franklin Square). It was a rather unassuming place, but inside was very elegant and romantic, so we got comfy very quickly, even after long work days both. The atmosphere was quiet enough for conversation, but still pleasant and bustling enough that we didn't feel isolated in our cozy booth. We had a fruity and drinkable Sangiovese blend bottle of wine to start, selected from an extensive book of intimidatingly expensive wines. There were some more reasonable bottles worked in, so it was all right. Speaking of menus, we actually chose to discard the Restaurant Week menu, as the offerings seemed a little lamer than the menu itself. Good for them though, I attribute that more to the quality of the regular menu than the complete lack thereof in the RW menu. Julia started with a very interesting salad, which I neglected to even try because I was quite wrapped up in my own salad: a filet mignon Carpaccio salad with arugula, capers, lemon juice and olive oil. 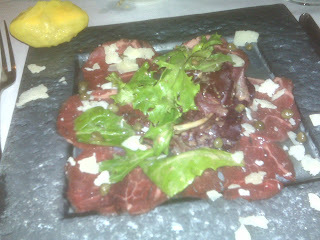 The acidity of the accoutrements paired quite well with the generous array of silky, tender, uber-thin slices of filet. I found it to be delicate and the flavors really popped. It was so light and went down so smooth that I had to slow down to savor each morsel. For our main entrees, we both ordered selections from their fresh made pasta offerings: Julia, a papparadelle with wild mushrooms, and I, a lobster ravioli with a lobster bisque sauce and chunks of lobster. Julia's was very tasty and she enjoyed it immensely. I thought the dish had a nice simple confidence, which can often make a dish even better than trying to be too complicated. Their fresh pasta was awesome, perfectly al dente and quite thick. 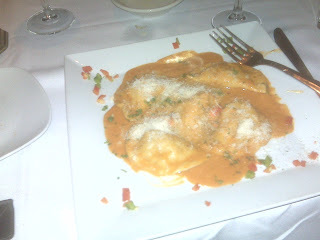 For my raviolis, the lobster stuffing was very plentiful but not overly flavorful, so the flavor and texture of the pasta helped them out. Of course, so did the sauce. The bisque was incredibly flavorful, and I could have eaten a bowl of it. Any other sauce, and this would have been a pretty mediocre dish, but the three layers of lobster worked together to make an very layered and bold dish. No part of it was over the top, and at five raviolis, wasn't a ton of it, but I can't help but say I really liked what I ate. If this had cost me ten more dollars, then I would have been a little disappointed that there were no enormous hunks of lobster, but for an under-$20 entrée it was pretty classy. We were quite satisfied with our first two courses, but none were large enough that we wanted to skip dessert, which for an Italian place is a little rare. It was actually nice to feel satisfied but not stuffed, even after finishing our plates. I ordered the profiteroles for dessert, which were actually some of the best profiteroles I have ever had. I don't quite know why I ordered them, since I usually find them dry and flavorless, but these were crispy and the crème was cool, rich and dense. I was served six or seven of them, and they were heavenly. My favorite part of the night was the company, but together, we especially enjoyed the pianist (Lenny Seidel we later learned), who was playing a luxe grand piano throughout the evening. He was very passionate and highly skilled – you could tell he was enjoying playing and had been doing so for a long time. The music was gentle but recognizable and really added to the cozy atmosphere that we really cherished. He played songs ranging from the Godfather to Messun Dorma to Edelweiss to Take Five by Dave Brubeck. It added to the fun of our evening, and we would definitely go back for another meal for the food but also for the atmosphere that Mr. Seidel helped create. In all, Tuscana West, despite being perhaps a little overlooked on the DC culinary stage, was quite impressive and worthy of such an occasion.